In this day and age, many of us do carry around at least a couple of gadgets – the quintessential smartphone is never far out of our sights, and so is the tablet that comes in handy when you need a larger viewing real estate compared to a smartphone, and yet do not want the bulk of a notebook. Not only that, there is this growing group of wearable technology known as the smartwatch with samples like the LG G Watch R, which means it is even more crucial to ensure that they remain juiced up before each day starts. Since you can never quite tell when something might go awry, why not be prepared with the $99.99 Pickup Power? 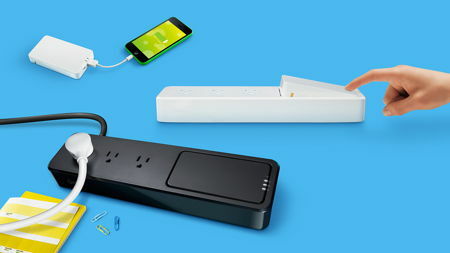 The Pickup Power happens to be a desktop power strip that sports a trio of AC outlets and 1080 joules of surge protection. Even better is the fact that it comes equipped with a portable battery as well which you are able to pop out and take with you in a jiffy. Imagine using it alongside a 4,000mAH or 6000mAH battery, and you will pack enough portable juice to power up the likes of e-book readers, tablets, smartphones, cameras, and others, regardless of where you are.